Distant view of City, Hyderabad. bl.uk > Online Gallery Home	> Online exhibitions	> Asia, Pacific and Africa Collections	> Distant view of City, Hyderabad. 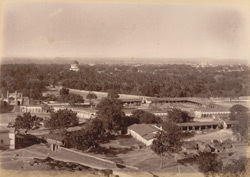 View looking over outlying buildings and palm groves towards the city of Hyderabad, Andrea Pradesh, photographed by Deen Dayal in the 1880s. This is from the Curzon Collection: 'Views of HH the Nizam's Dominions, Hyderabad, Deccan, 1892'. Hyderabad was founded beside the River Musi in 1591 by Muhammad Quli Qutb Shah (r.1580-1612) as an alternative to his capital at Golconda. The town was laid out in a grid pattern with two main roads running east to west and north to south; the Char Minar, or Four Towers, sits at the intersection of these two roads. Nizam al-Mulk, entitled Asaf Jah (d. 1748), founded the Asafi Jahi dynasty in 1724. The rulers, known as the Nizams of Hyderabad, reigned until 1948.